Recursos Moviles not only provides you with regular web tools to implement our service in your sites, but also with tools that add value to our system and will be very useful for webmasters. Here you can find some of those tools. They are very effective and they will help you to simplify and customize many of the daily tasks in systems like ours..
We have developed Recursos Moviles to be a flexible and customizable system in vast variety of areas. WE did this because we consider that the webmaster has the right not only to choose what to sell, but also where to sell it and how much the customers will pay for it. In the section ?rates settings? 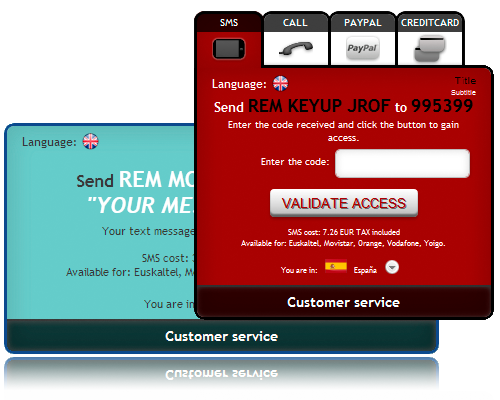 you can choose the SMS value for each available country that you will use. For example, you can use the gateway tool for Spain and set the 3.44 ? SMS and you can also use the URL Protection tool and set the 6.96 ? SMS. You will have this option for every country that offers more than one SMS rate. Edit the web tools or modify your Recursos Moviles account information are very important actions that you must be able to do. Our system has sections specially created to edit you account and every tool you may use. Remember to keep up to date all your personal information. If we need to contact you, we will use the information you provided in your account for this purpose. You can also edit every web tool you have created. Let`s say you want to change the answers you use for them or their settings (SMS amount, available countries, protected URLs, server IP for gateway, etc) or any other aspects of your tools, you?ll be able to do it here. The iframes that RM has to offer you, allow you to customize their style to get the look and feel that you are looking for, so that, the iframes will match the styles of those sites were they will be used. A great advantage of this tool is that the webmaster has the chance to modify every aspect of its appearance just by entering a parameter in the invocated url with the style value. This makes very simple the customization process, allowing you to change iframes styles in a very dynamic way and straight in your site code. We offer the webmaster a wide variety of ?flash? 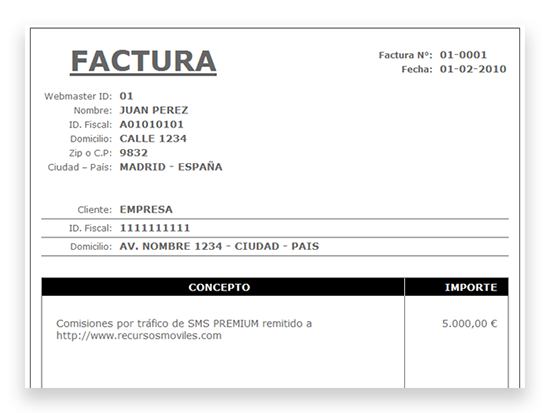 banners that they will be able to use in their sites to promote very appealingly Recursos Moviles referrals program. This tool is available in standard sizes used in today internet promotions market; you will always find a banner that suits your site needs. Soon, we will add new designs so you have more to choose from. Now use the income generated within our system to get high quality hosting and at a very low cost to your sites and web projects. 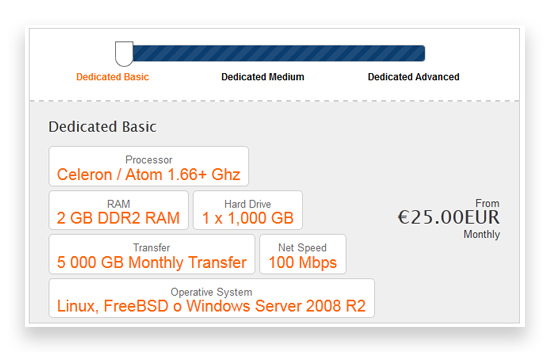 Red Servicio offers several hosting plans for all kinds of needs, with self-installable scripts to set Blogs and forums very easily, just with a single click. Without any doubt, this is an excellent resource and a useful tool for webmasters. Each time you request a payment for revenues generated through the system, you will need to submit an invoice in your name in order to collect your money. Our system will save a PDF copy of each invoice generated, which you can view, print or download to your hard drive whenever you need it, either for accounting purposes or to track every payment you request to our system. We know that a complex system like Recursos Moviles, must always offer a fast and secure way for webmasters to report any type of errors they found. 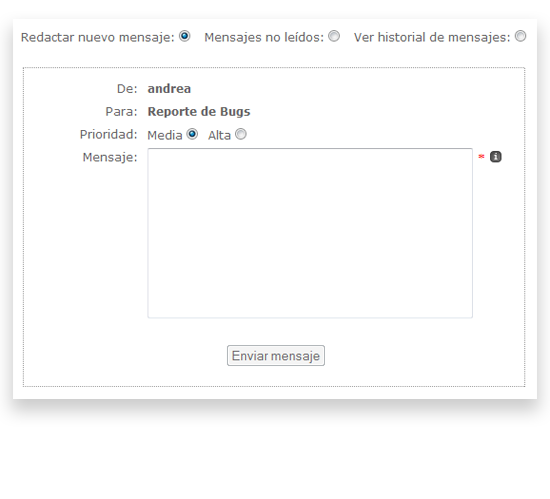 To do this, we created the "Report Bugs" form. Once the bug is reported, our developing team will respond immediately with a solution to the reported issue.